Get a group of divers and snorkelers talking about dream destinations, and pretty soon someone will mention Raja Ampat. Even the name sounds exotic. But unless someone in the group has actually been, or is studying for the geography category on Jeopardy, it’s unlikely they could find the place on a map. It doesn’t help to know that it’s in Indonesia, because that’s a bit like saying Mount Rushmore is in North America. The nation of Indonesia is spread out over more than 13,500 islands set in an area of ocean larger than the United States. If you started tossing darts at a map of the country, it would take a lot of luck to stick one in Raja Ampat. The name Raja Ampat means “four kings,” which is a reference to the area’s four main islands: Misool, Salawati, Batanta and Waigeo. To find them on Google Earth, start by searching for the large island of Papua. Scroll to the west, which is the part owned by Indonesia. Zoom in on the funny-shaped spit of land known as the Bird’s Head Peninsula, then look a little farther west. Congratulations—you’ve found the islands of Raja Ampat! And did we mention that the waters around these islands are home to the highest level of marine biodiversity on the planet? Though relatively small compared to Indonesia in general, the Raja Ampat region still takes in an area roughly 120 by 100 miles in total. In addition to the underwater attractions that have made these waters famous, the islands themselves are extremely scenic. Many are surrounded by hundreds of small limestone islets that rise from clear waters like green-topped sugarloafs and haystacks, some with steep shorelines undercut by wave erosion, others that hide white-sand beaches in small coves. In short, it is a landscape tailor-made for postcards and screen-savers. Like other areas of Indonesia, the Raja Ampat archipelago lies within the much-vaunted Coral Triangle, which is generally acknowledged as the most biologically diverse marine region in the world. But even within these species-rich waters, Raja Ampat holds a special place in terms of the critter count. Because the islands are located between the Indian and Pacific Oceans, coral and fish larvae are more easily shared between the two oceans, and the species count goes up as a result. Various censuses have yielded totals of more than 1,500 fish species, 700-plus species of mollusk and more than 540 coral species. Put another way, the reefs are home to 96 percent of all hard-coral species found in Indonesia, and 75 percent of any found around the world. What all these numbers add up to is a ranking that earns Raja Ampat honors as the most bio-diverse and coral-rich marine habitat in the world. Another factor that further enhances the quality of the underwater landscapes of Raja Ampat is the remoteness of the area, which has left it largely undisturbed by human activity. In 2013, the Indonesian government set aside the entirety of the Raja Ampat region as a shark sanctuary. A general lack of fishing pressure allows marine life to thrive and grow to full maturity. Divers will appreciate the warm waters, but there’s another benefit to the region’s relatively high sea surface temperatures: studies have shown that by adapting to the warm waters, the reefs may be more resistant to threats like coral bleaching and coral disease. What Can You See in Raja Ampat? In addition to its famous bio-diversity, the Raja Ampat region offers a similarly broad range of diving and snorkeling experiences. There are reefs of course, some beginning in shallow water close to shore, others extending into open water as slopes or walls. There are pinnacles, rocks, calm water bays and current-washed channels that provide exciting drifts. White-tip and black-tip reef sharks are commonly found while one of the region’s signature sharks, the wobbegong can be a bit more challenging as their camouflaging can keep them hidden among the coral and rubble of the bottom. Reefs are home to a broad variety of snapper and sweetlips, which often gather in large numbers. Even larger, and sometimes massive, are the schools of fusiliers and anthias, surgeonfish, triggerfish and bannerfish. Slopes and walls are patrolled by Napoleon wrasse, bumphead parrotfish, turtles and the occasional manta ray. Drifts in open waters propel divers into massive shoals of trevally and tuna, provide opportunities to interact with dolphins, and a chance for whale shark sightings. At several areas throughout the archipelago, divers can encounter manta rays either feeding or visiting cleaning stations. At the other end of the spectrum, there are sediment-rich shallows that provide prime muck-diving opportunities. These waters are nudibranch central, with rosters that include colourful varieties of ceratasoma, chromodoris, risbecia and more. Other signature finds include pygmy sea horses, ghost pipefish, pygmy squids and bamboo sharks, including the recently discovered “walking shark.” The sands also hide ambush predators such as reef stonefish, spinydevil scorpionfish and stargazers. Mangrove-lined shore create yet another unique underwater landscape, as tree roots often grow right into the shallow corals, and create a habitat for juvenile reef fish and a range of brackish-water coastal species. A prized find are the archerfish, which lurk among the roots and spit jets of water into the air to knock insets from low hanging branches. Mangroves shallows and some nearby reefs are also home to saltwater crocodiles, though sightings are rare. Raja Ampat is also the only place outside of Palau where snorkelers can swim with non-stinging jellyfish within confined lakes. There are several dive lodges scattered across the islands of Raja Ampat, and several live-aboard boats that cruise the archipelago, either seasonally or year-round. Getting to Raja Ampat is not difficult, but it will require a domestic flight from hubs such as Jakarta or Bali to the coastal town of Sarong in West Papua. Most live-aboard boats depart from this port, as do the island ferries that connect to land-based lodges on the outer islands. Some boats cruise the area from October to May, then move to the Komodo region for the remainder of the year. Given the size of Raja Ampat, it would be impossible to see it all on a single visit or week-long cruise, and many boats create flexible itineraries based on conditions. As a result, it’s best not to get hung up on visiting any particular site mentioned in a “best of” list compiled by a website or publication. It you are thinking about planning a trip to Raja Ampat, feel free to give us a call. 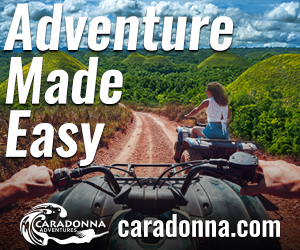 The Caradonna team not only knows Raja Ampat, we are experts at navigating the intricacies and details of flights, transfers, bookings and paperwork. And we’re never too busy to talk arouse our favorite subject: diving.